BAM celebrates ten years of innovative film programming with the launch of BAMcinemaFEST, a new film festival featuring fifteen New York premieres, outdoor screenings, all-night movie marathons, artist Q&As, live music, and much more. 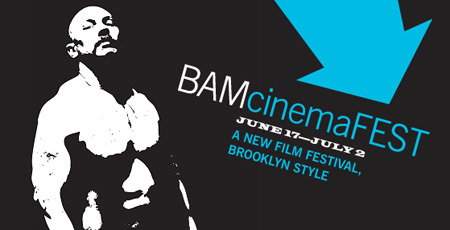 For complete information, visit BAM.org/BAMcinemaFEST. The NY premiere of Don't Let Me Drown, a major discovery of the 2009 Sundance Film Festival, is followed by a free Opening Night party for film ticket holders. A limited number of tickets remain. BAMcinemaFEST presents eighteen new films that provide a snapshot of some of the most vital new voices in independent cinema today, including Armando Iannucci's In the Loop, Lynn Shelton's Humpday, Andrew Bujalski's Beeswax, Robert Siegel's Big Fan, and Nicolas Winding Refn's Bronson. BAMcinemaFEST features fifteen NY premieres! BAMcinemaFEST presents two outdoor screenings of the documentaries William Kunstler: Disturbing the Universe and What's on Your Plate? co-presented by Rooftop Films and Afro-Punk. This special event features four movie marathons and an all-night dance party with DJ Delphine Blue. The movie marathon themes include Diana Ross Coming Out, Before They Were Scientologists, and All Night Bong. Popular ambient rock collective 3epkano performs an explosive original score to Fritz Lang's Metropolis. Tickets are limited. BAMcinemaFEST presents 29 short films, including animation, narrative, documentary, and experimental work. Each programs features a Q&A with a selection of filmmakers. This special sidebar pays tribute to unique moments in BAMcinématek's 10 year history with a series of special repertory screenings. Includes a special evening with French filmmaker Arnaud Desplechin and screenings of Jim Jarmusch's Dead Man and Luchino Visconti's The Leopard.